You can see the status of all endpoints in the Management Portal. 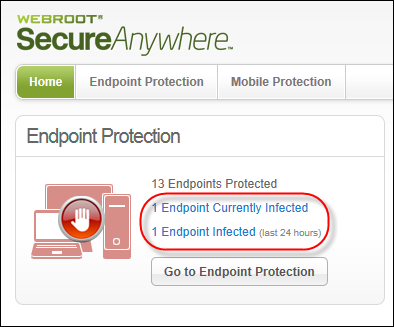 Endpoints report their status when SecureAnywhere runs a scan on them or when a polling interval has completed. Note: To see more detailed information about an endpoint's scan history, see Checking scan results and managing threats. Log in to the SecureAnywhere website: https://my.webrootanywhere.com. Click the Go to Endpoint Protection button. If any endpoints are infected, you can click a link for those endpoints to go directly to a details panel. 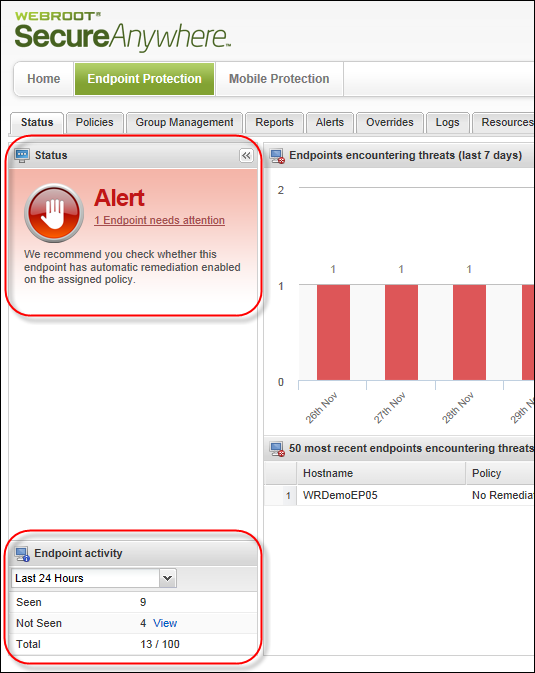 When the Management Portal opens, you can see the endpoint status in the left panels for Status and Endpoint activity. If you see an alert message in the Status panel, click the link to display more information about the endpoints. If any endpoints have not reported into the portal, in the Endpoint activity panel, in the Not Seen row, click the View link. You can see endpoints in the Status tab and the Group Management tab. The Group Management tab provides more detailed information; see Organizing endpoints into groups.